Hi everyone! I hope you are having a great week! It has been a busy one for me! To help some of my friends, and make some additional cash, I have started a little side business of house-sitting, pet sitting and babysitting! This week I have been really busy doing a little of all of the above. For the past couple of nights I have been staying at a friend's house to house sit and cat sit. Along with taking care of her cats I just do the small everyday tasks such as pulling up the trash cans, and checking their voice mails etc. It has been so much fun have some furry friends to come home to. I also babysat just this afternoon. I watched Heather’s beautiful daughter Caroline. Caroline has never had a babysitter before. Heather and I were worried about how she would react when she realized her mom was gone.. but she was fine! 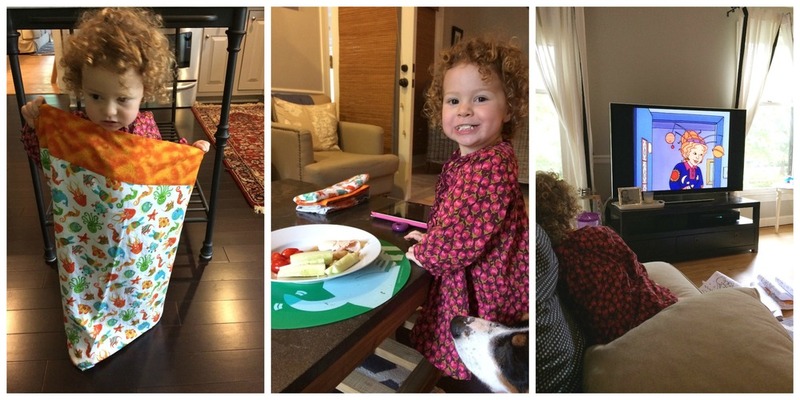 We made some arts and crafts, and had a delicious and nutritious lunch together of whole wheat pasta, string cheese and cherry tomatoes (her favorite). We also watched the Magic School Bus! I forgot how great of a show that is! After returning back to my kitties and finishing a couple more tasks for the home I couldn’t help but feel a little like Amelia Bedelia. I am enjoying living in a temporary home and taking care of my temporary pets but I have to admit I am a little exhausted and grateful that that all of this is temporary. I didn’t realize how incredibly independent and responsibility free I really am. I am looking forward to the chapter of my life when I have pets to come home to, a house that has a big trashcan and recycling bin, and a driveway to roll the bins up. Hopefully I will have a daughter to care for some ways down the road as well..no time soon though! For now I am grateful I can play with my friends' pets and children. Just call me Hannah Bedelia for now :) Which reminds me.. I need to cook more often! Recipes are soon to come on Hannahsplaybook! You guys have fun this weekend! Newer PostSprinkles on My Sunday!